As was expected, Archie comics has formally submitted a motion for summary judgment in the US District court for the Southern District of New York in the ongoing legal dispute over Ken Penders’s copyright claims to the Sonic comics. The motion was filed Monday, the deadline set by the court for the company to do so. In the filing, which TSSZ has obtained a copy of, Archie believes it is entitled to summary judgment in its favor on its claims, which include two counts of breach of contract. Archie has also asked the court to rule in the event of summary judgment against Penders’s counterclaims, which includes three counts of copyright infringement. Archie is also seeking a court order, should the company prevail, for Penders to cancel his registered copyrights in dispute. The filing includes a surprise affidavit that could damage Penders’s defense. Former Archie Vice President of Finance for Archie, Ed Spallone, alleges in his remarks that he has executed copies of independent contractor agreements signed by Penders in 1996, and they are attached to the affidavit as exhibits. That’s important as Spallone was the individual within Archie who prepared the work for hire agreement for Penders. It is also important because according to the case’s pre-trial report (which we’ll dive into later this week), Spallone was lined up as a witness for Penders and the defense. “I know that ACP [Archie Comic Publications] did in fact send these agreements signed by me out to Ken Penders and that ACP did receive these agreements back from Ken Penders, signed by him, several weeks later,” Spallone says in the affidavit. There are two other noteworthy items in the filing. First, to strengthen its claim with Penders, Archie Comics cites previous precedent in its copyright dispute with the late Dan Decarlo, creator of Josie and the Pussycats, which the same court oversaw when the case was files in 2001. “The Court concluded that the Contractor’s Agreement controlled the disposition of all claims to ownership of all the works in favor of ACP, and entered judgment in favor of ACP,” reads the filing, referring to an earlier passage that said DeCarlo submitted work to the company before his work for hire agreement was formally executed. Then there’s this–the blocks of black you see in the image above. They may not appear to be much, but they actually are our first indication of a rift between Archie and Sega over this legal mess. 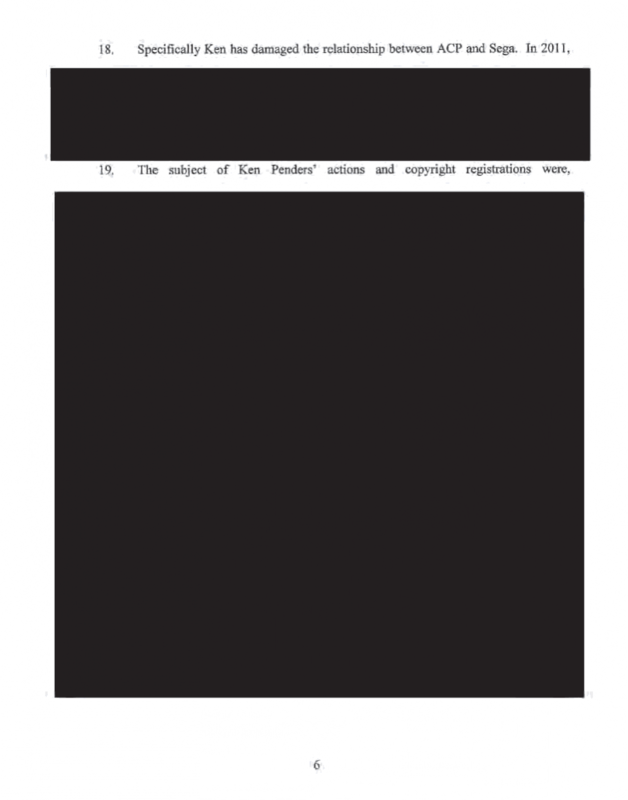 The blocked out material, along with several exhibits missing from the dockets, appear to be redacted from public record via a protection order. In certain areas of the motion and supporting affidavits, it’s easy to see why: material appears protected right before introduced discussion about Sega’s business practices with Archie, and the agreement the two share to produce the Sonic comics in general. Specificially Ken has damaged the relationship between ACP and Sega. We should note this is a motion, not a judgment or a court order. Penders and his legal team have until March 6 to file a response and/or an opposition. Even then, a ruling may not come until much later. A ruling in favor of Archie may not be a slam dunk, either, and should this motion be denied, it may compel Archie to seek settlement terms with Penders. In lieu of that, the case would go to trial. We’ll examine the pre-trial report–and the surprising past contributors to the Sonic comics Penders plans to call if it gets that far–later this week.